Majority of Kenyans out there have no access to medical cover mainly because some of the health systems available don’t work for their benefit. Life becomes hard and serious illnesses drain families financially. But in a country where health insurance seems far-fetched, some like the Minet medical cover for teachers offer the best services to members of the Teachers Service Commission (TSC) and their dependents. Minet cares enough for the welfare of all teachers. Where all other systems have failed, it has saved the day. 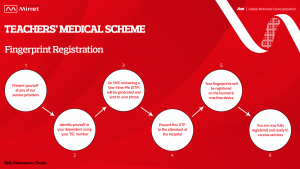 With numerous benefits like providing cover for chronic diseases like epilepsy and cancer among others, every TSC member has no reason to not register for the service. Accidents inevitably happen, and when they do, it takes a toll on everyone. Unfortunately, hospital bills could pile up and life gets even worse. This is especially the case if one is to be flown out of the country for treatment. Luckily, those who have already registered for Minet cover get to enjoy quality health care abroad. The cover caters for airfare, accommodation, travel assistance including picking you up at the airport when you get back home. It will also make a follow up of your condition to see how you are fairing on. 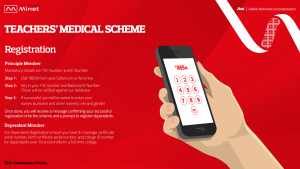 That said, how does one register for Minet Teachers Medical Scheme? First of all, if you are a member of the TSC, you are automatically eligible for the cover. Then it follows that you as the principal member has to register yourself and your dependants. The process is done in two steps; using the Unstructured Supplementary Service Data (USSD) and biometric method. Requirements include your TSC Number and your national Identity number. Enter your TSC and national ID number if prompted. Wait for the details to be verified against Minet’s database. If correct, you will get a prompt asking you to key in your names, your role, and your gender. Confirm the details. Once done, you will receive a message confirming your successful registration onto the scheme and a prompt to register dependants. For this procedure, make sure that you have the necessary details like serial numbers for the marriage certificate and birth certificate, and college ID number for dependents in tertiary institutions. The registration of defendents also follow the same dialing of the USSD code *865#, but here, you will select the dependent you want to register, whether it is your spouse or your children. Enter the date of birth, full name, and ID Number/Birth Certificate Number. You can always reach out to Minet’s customer care for assistance in case of any difficulties. This procedure is for fingerprint registration. You will be required to place your index finger and thumb on the biometric device and the details will be registered on the biometric device. You are now fully registered and ready to receive Minet’s services. Remember, for this process, an appointed guardian or a parent can register children under 5 years of age. 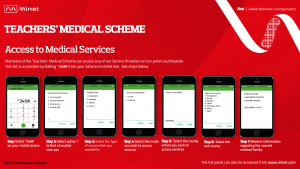 You will then receive information and a recommendation about the nearest medical facility where you can access healthcare services. It is that simple. See, it is worth it, yes?